We had such a blast helping sweet Gabriella celebrate her 9th birthday last weekend! 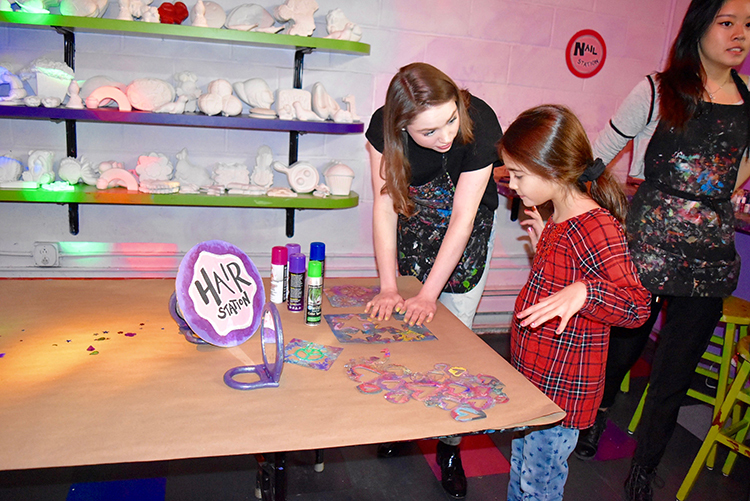 She wanted a Superhero birthday party that also had an amazing dance party, makeup, crafts and more...so we knew we had to turn to the Craft Studio on the Upper East Side to help us with this amazing celebration. The Craft Studio hosts the coolest parties in the city, and this one was no exception! A quick disclaimer before you read this post...I took all of these photos myself, so I apologize in advance for the less than perfect photography!! The kids came in and had their choice of hair stamping, makeup, face paint or superhero tattoos. And of course a custom photo booth! No LMP party is complete without a custom photo backdrop from Minted. We absolutely LOVE using their backdrops. They're so gorgeous and come ready to hang with metal grommets at the top. The best part? The backdrop is made of fabric so it's completely reusable! After they finished creating Superhero sleep masks an wristbands, it was time for the best part of every birthday party...PIZZA! Each child had their own superhero setup! I knew the birthday girl was going to be dressing up as Catwoman so I had this custom confetti made just for her! Now it was time to DANCE DANCE DANCE! And boy did they ever! Dancing certainly does work up an appetite for some sweets...and our sweet table was packed with yummy treats. We love these mini sugar donuts from Doughnuttery, they come delivered still warm! The Superhero brownie pops from Making That Cake turned out adorable! And they tasted just as good as they looked. I created a quick and easy Superhero City Candy display using glass cubes of varying sizes, black electrical tape and a piece of black foam core for the backdrop. Pretty cool, right? The kids got to pick white cheddar or Kettle POPcorn from these adorable Superhero themed boxes. Last, but certainly not least...this CAKE. Empire Cake does it again! Can you even believe what they can create with Sugar?? A-mazing!!! Everyone was able to take sweets home with these custom To-Go boxes! It was a fantastic party for a fantastic little girl. We had such a good time working with her and her mom!! HAPPY 9th Birthday Gabriella ! !